In 1939 a writer for the Weekly Times marvelled at the oddities of Hollywood, including the revelation of the drive-in bank. Australia had to wait another 15 years for the drive-in bank to arrive, with the first branch opening at the English, Scottish and Australian (ES&A) Bank in Camberwell Junction, Melbourne, 1954. The official opening was written up in the papers. Lord Baillieu, Director of the ES&A Bank in London, visited Australia for the opening and was meant to be the first customer but was pipped at the post by two other eager beavers driving in ahead of him. He reported that the whole transaction took less than two minutes. Bank robbers must have been thrilled to learn they’d no longer have to leave their getaway car – until reading of the teller’s window being made of bullet-proof glass! 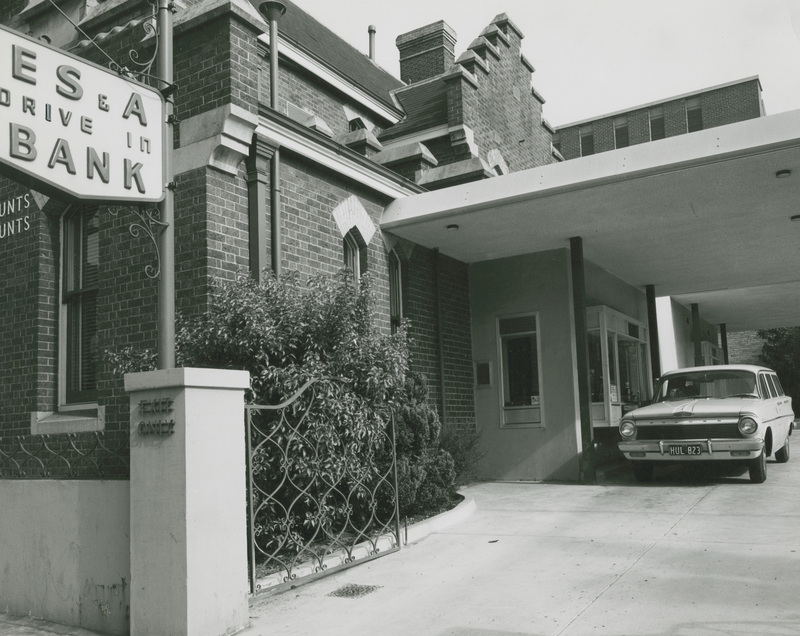 The above photo from our Melbourne Harbour Trust collection shows the drive-in bank some years later – we’re estimating mid-1960s. You can clearly see the teller’s window and the roof awning to prevent your arm and cash from getting wet in the rain. The original building, sans the drive through elements, was constructed in 1885, and designed by architects William Wardell and W L Vernon. It was built in the Camberwell Junction location to provide loans to the builders constructing homes in the area in the 19th century. After ES&A Bank merged with ANZ, the branch was sold to Henley’s cars. The building remains today as a rare example of Wardell’s bank architecture in gothic style and is now a restaurant known as The Meat & Wine Co. Present day photo of the building that was the old ES&A drive-in bank, taken by Samantha Courtier. No doubt, landing the first drive-in bank in Australia was seen as a big coup for Melbourne, with this image featured in the Melbourne Harbour Trust collection alongside photos of other Melbourne landmarks, architecture and spots considered worthy of boasting about to tourists, ie. the Shrine, Sydney Myer Music Bowl, various business headquarters, theatres, beaches and shopping centres. When I first saw the photo I was shocked. I’d never seen nor even heard of a drive-in bank! A quick survey of my PROV colleagues revealed only about five staff remembered drive-in banking at all. The few who did, suggested they weren’t around very long as not many people used them. Meg said the drive-in bank in Cheltenham was running through the 1980s but closed by the early 1990s when it became a funeral parlour. For a time, it seems, there were drive-in banks right across the country. 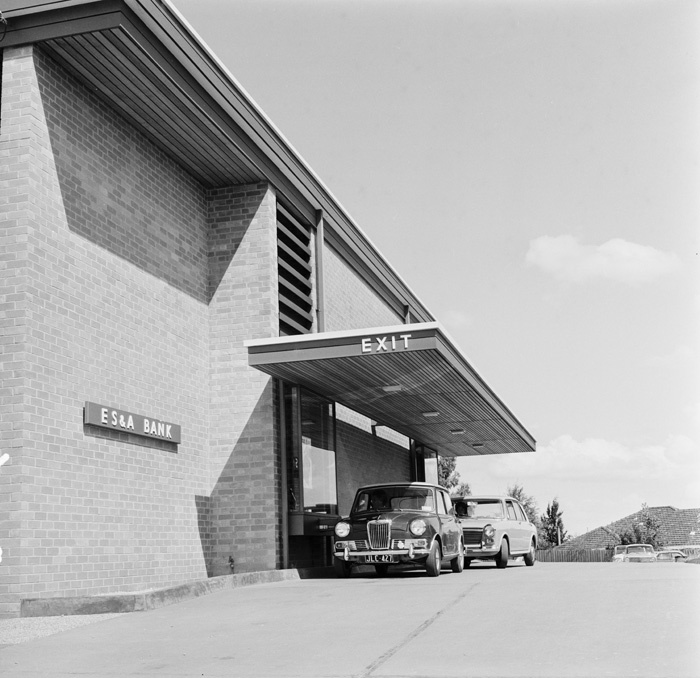 This photo from the National Archives of Australia collection shows a similar ES&A Bank drive-in service in NSW in 1971. 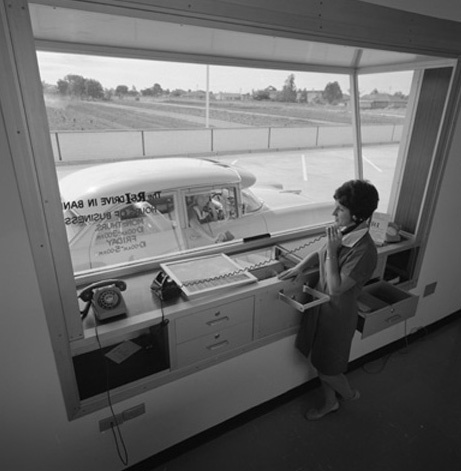 While this photo from the State Library of Western Australia shows the view from inside, at an Innaloo branch of the R&I Bank, in 1967. While the old window style seems to have disappeared, there are drive-in ATMs in Geelong West and Boundary Road near Aspendale Gardens (displayed below on Google street view.) Perhaps there’s a few more dotted around the country? Drive-in banks live on in America and elsewhere throughout the world, with some currently opening in the UK. Thanks to my PROV colleagues who provided recollections, links and suggestions for this blog post.